Light therapy or phototherapy (classically referred to as heliotherapy) consists of exposure to daylight or to specific wavelengths of light using polychromatic polarised light, lasers, light-emitting diodes, fluorescent lamps, dichroic lamps or very bright, full-spectrum light. The light is administered for a prescribed amount of time and, in some cases, at a specific time of day. The treatments involve exposing the skin to ultraviolet light. The exposures can be to small area of the skin or over the whole body surface like in a tanning bed. The most common treatment is with narrowband UVB (NB-UVB) of 311-313 nanometer. It was found that this is the safest treatment wavelength. Full body phototherapy can be delivered at doctor's office or at home using a large high power UVB booth. In psoriasis, UVB phototherapy has been shown to be effective. A feature of psoriasis is localized inflammation mediated by the immune system. Ultraviolet radiation is known to suppress the immune system and reduce inflammatory responses. Light therapy for skin conditions like psoriasis usually use NB-UVB (311 nm wavelength) though may use UV-A (315–400 nm wavelength) or UV-B (280–315 nm wavelength) light waves. UV-A, combined with psoralen, a drug taken orally, is known as PUVA treatment. In UVB phototherapy the exposure time is very short (seconds to minutes depending on intensity of lamps and the person's skin sensitivity). The time is controlled with a timer that turns off the lamps after the treatment time ends. One percent of the population suffer from vitiligo, and Narrowband UVB Phototherapy is an effective treatment. "NB-UVB phototherapy results in satisfactory repigmentation in our vitiligo patients and should be offered as a treatment option." 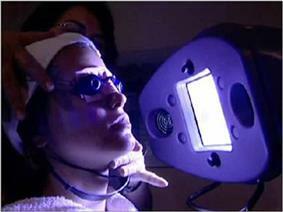 High intensity blue light (425nm) used for the treatment of acne. Evidence for light therapy and lasers in acne vulgaris as of 2012 is not sufficient to recommend them. There is moderate evidence for the efficacy of blue and blue-red light therapies in treating mild acne, but most studies are low quality. While light therapy appears to provide short term benefit, there is a lack of long term outcome data or data in those with severe acne. According to the American Cancer Society, there is some evidence that ultraviolet light therapy may be effective in helping treat certain kinds of skin cancer, and ultraviolet blood irradiation treatment is established for this application. However, alternative uses of light for cancer treatment – light box therapy and colored light therapy – are not supported by evidence. Phototherapy can be effective in the treatment of eczema, atopic dermatitis, polymorphous light eruption, cutaneous T-cell lymphoma and lichen planus. Narrowband UVB lamps, 311–313 nanometer is the most common treatment. Low level laser therapy has been studied as a potential treatment for chronic wounds. Reviews of the scientific literature do not support the widespread use of this technique due to inconsistent results and low research quality. Higher power lasers have also been used to close acute wounds as an alternative to stitching. Full sunlight or exposure to bright light from a light box is used to treat seasonal affective disorder (SAD). Light boxes for SAD are designed to filter out most UV light, which can cause eye and skin damage. Mayo Clinic states that light therapy is a proven treatment for seasonal affective disorder. It is considered a first-line treatment. Controlled-trial comparisons with antidepressants show equal effectiveness, with less expense and more rapid onset of therapeutic benefit, though a minority of patients may not respond to it. Direct sunlight, reflected into the windows of a home or office by a computer-controlled mirror device called a heliostat, has also been used as a type of light therapy for the treatment of SAD. The effectiveness of light therapy for treating SAD may be linked to the fact that light therapy makes up for lost sunlight exposure and resets the body's internal clock. Studies show that light therapy helps reduce the debilitating and depressive behaviors of SAD, such as excessive sleepiness and fatigue, which results lasting for at least 1 month. Light therapy is preferred over antidepressants in the treatment of SAD because it is a relatively safe and easy therapy. 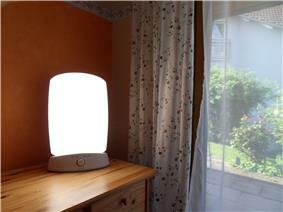 It is possible that response to light therapy for SAD could be season dependent. Morning therapy has provided the best results because light in the early morning aids in regulating the circadian rhythm. Light therapy has also been suggested in the treatment of non-seasonal depression and other psychiatric disturbances, including major depressive disorder, bipolar disorder and postpartum depression. A meta-analysis by the Cochrane Collaboration concluded that "for patients suffering from non-seasonal depression, light therapy offers modest though promising antidepressive efficacy." A 2008 systematic review concluded that "overall, bright light therapy is an excellent candidate for inclusion into the therapeutic inventory available for the treatment of nonseasonal depression today, as adjuvant therapy to antidepressant medication, or eventually as stand-alone treatment for specific subgroups of depressed patients." A 2015 review found that supporting evidence for light therapy was weak due to serious methodological flaws. In the management of circadian rhythm disorders such as delayed sleep phase disorder (DSPD), the timing of light exposure is critical. For DSPD, the light must be provided to the retina as soon after spontaneous awakening as possible to achieve the desired effect, as shown by the phase response curve for light in humans. Some users have reported success with lights that turn on shortly before awakening (dawn simulation). Morning use may also be effective for non-24-hour sleep–wake disorder, while evening use is recommended for advanced sleep phase disorder. Light therapy has been tested for individuals on shift work, and for jet lag. Light therapy has been trialed in treating sleep disorders experienced by patients with Parkinson's disease. 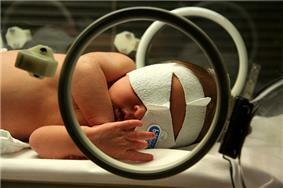 A newborn infant undergoing white-light phototherapy to treat neonatal jaundice. Light therapy is used to treat cases of neonatal jaundice through the isomerization of the bilirubin and consequently transformation into compounds that the newborn can excrete via urine and stools. A common treatment of neonatal jaundice is the bili light. One of the treatments is using blue light with aminolevulinic acid for the treatment of actinic keratosis. This is not a U.S. FDA-approved treatment for acne vulgaris. The brightness and color temperature of light from a light box are quite similar to daylight. The production of the hormone melatonin, a sleep regulator, is inhibited by light and permitted by darkness as registered by photosensitive ganglion cells in the retina. To some degree, the reverse is true for serotonin, which has been linked to mood disorders. Hence, for the purpose of manipulating melatonin levels or timing, light boxes providing very specific types of artificial illumination to the retina of the eye are effective. Light therapy uses either a light box which emits up to 10,000 lux of light at a specified distance, much brighter than a customary lamp, or a lower intensity of specific wavelengths of light from the blue (460 nm) to the green (525 nm) areas of the visible spectrum. A 1995 study showed that green light therapy at doses of 350 lux produces melatonin suppression and phase shifts equivalent to 10,000 lux white light therapy, but another study published in May 2010 suggests that the blue light often used for SAD treatment should perhaps be replaced by green or white illumination, because of a possible involvement of the cones in melatonin suppression. In treatment, the patient's eyes are to be at a prescribed distance from the light source with the light striking the (lower) retina. This does not require looking directly into the light. Light boxes should have been tested successfully in peer-reviewed clinical trials. The box should provide 10,000 LUX of illumination at a comfortable sitting distance. Product specifications are often missing or unverified; illuminance can be controlled using a light meter. Blue light is known to be superior to red light in managing depressive symptoms which have a seasonal pattern. Smaller is not better; when using a compact light box, even small head movements will take the eyes out of the therapeutic range of the light. Ultraviolet light causes progressive damage to human skin. This is mediated by genetic damage, collagen damage, as well as destruction of vitamin A and vitamin C in the skin and free radical generation. Ultraviolet light is also known to be a factor in formation of cataracts. Researchers have questioned whether limiting blue light exposure could reduce the risk of age-related macular degeneration. Modern phototherapy lamps used in the treatment of seasonal affective disorder and sleep disorders either filter out or do not emit ultraviolet light and are considered safe and effective for the intended purpose, as long as photosensitizing drugs are not being taken at the same time and in the absence of any existing eye conditions. Light therapy is a mood altering treatment, and just as with drug treatments, there is a possibility of triggering a manic state from a depressive state, causing anxiety and other side effects. While these side effects are usually controllable, it is recommended that patients undertake light therapy under the supervision of an experienced clinician, rather than attempting to self-medicate. It is reported that bright light therapy may activate the production of reproductive hormones, such as testosterone, luteinizing hormone, follicle-stimulating hormone, and estradiol. There are few absolute contraindications to light therapy, although there are some circumstances in which caution is required. These include when a patient has a condition that might render his or her eyes more vulnerable to phototoxicity, has a tendency toward mania, has a photosensitive skin condition, or is taking a photosensitizing herb (such as St. John's wort) or medication. Patients with porphyria should avoid most forms of light therapy. Patients on certain drugs such as methotrexate or chloroquine should use caution with light therapy as there is a chance that these drugs could cause porphyria. Side effects of light therapy for sleep phase disorders include jumpiness or jitteriness, headache, eye irritation and nausea. Some nondepressive physical complaints (such as poor vision and skin rash or irritation) may improve with light therapy. Many ancient cultures practiced various forms of heliotherapy, including people of Ancient Greece, Ancient Egypt, and Ancient Rome. The Inca, Assyrian and early German settlers also worshipped the sun as a health bringing deity. Indian medical literature dating to 1500 BCE describes a treatment combining herbs with natural sunlight to treat non-pigmented skin areas. Buddhist literature from about 200 CE and 10th-century Chinese documents make similar references. The Faroese physician Niels Finsen is believed to be the father of modern phototherapy. He developed the first artificial light source for this purpose. Finsen used short wavelength light to treat lupus vulgaris, a skin infection caused by Mycobacterium tuberculosis. He thought that the beneficial effect was due to ultraviolet light killing the bacteria, but recent studies showed that his lens and filter system did not allow such short wavelengths to pass through, leading instead to the conclusion that light of approximately 400 nanometers generated reactive oxygen that would kill the bacteria. Finsen also used red light to treat smallpox lesions. He received the Nobel Prize in Physiology or Medicine in 1903. Scientific evidence for some of his treatments is lacking, and later eradication of smallpox and development of antibiotics for tuberculosis rendered light therapy obsolete for these diseases. Since then a large array of treatments using controlled light have been developed. Though the popular consumer understanding of "light therapy" is associated with treating seasonal affective disorder, circadian rhythm disorders and skin conditions like psoriasis, other applications include the use of low level laser, red light, near-infrared and ultraviolet lights for pain management, hair growth, skin treatments, and accelerated wound healing. ^ "UVB phototherapy and skin cancer risk: a revi... [Int J Dermatol. 2005] - PubMed - NCBI". Ncbi.nlm.nih.gov. 2014-01-24. ^ "Treating psoriasis: light therapy and phototherapy - National Psoriasis Foundation". Psoriasis.org. 2014-02-14. Retrieved 2014-02-18. ^ Diffey BL (1980). "Ultraviolet radiation physics and the skin". Phys. Med. Biol. 25 (3): 405–426. ^ "What is Psoriasis: What Causes Psoriasis?". 29 January 2012. Retrieved 11 July 2012. ^ Adauwiyah J, Suraiya HH (December 2010). "A retrospective study of narrowband-UVB phototherapy for treatment of vitiligo in Malaysian patients". Med. J. Malaysia 65 (4): 297–9. ^ Titus S, Hodge J (October 2012). "Diagnosis and treatment of acne". Am Fam Physician 86 (8): 734–40. ^ Pei S, Inamadar AC, Adya KA, Tsoukas MM (2015). "Light-based therapies in acne treatment". Indian Dermatol Online J 6 (3): 145–57. ^ Hession MT, Markova A, Graber EM (2015). "A review of hand-held, home-use cosmetic laser and light devices". Dermatol Surg 41 (3): 307–20. ^ Hamilton FL, Car J, Lyons C, Car M, Layton A, Majeed A (June 2009). "Laser and other light therapies for the treatment of acne vulgaris: systematic review". Br. J. Dermatol. 160 (6): 1273–85. ^ Baron ED and Stevens SR. "Phototherapy for cutaneous T-cell lymphoma". nih.gov. ^ a b c Bouzari N, Elsaie ML, Nouri K (2012). "Laser and Light for Wound Healing Stimulation". In Nouri K. Lasers in Dermatology and Medicine. Springer London. pp. 267–275. ^ Posten W, Wrone DA, Dover JS, Arndt KA, Silapunt S, Alam M (2005). "Low-level laser therapy for wound healing: mechanism and efficacy". Dermatol Surg 31 (3): 334–40. 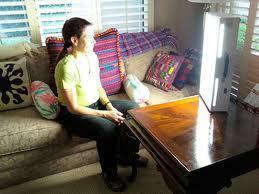 ^ "Seasonal affective disorder treatment Choosing a light box". ^ "Light therapy". Mayo Clinic. 7 October 2010. Retrieved 11 July 2012. ^ a b Even, C; Schröder, CM; Friedman, S; Rouillon, F (2008). "Efficacy of light therapy in nonseasonal depression: A systematic review". Journal of Affective Disorders 108 (1–2): 11–23. ^ Lam, RW, Levitt AJ, Levitan RD, Enns M, Morehouse R, Michalak EE, Tam EM (2006). "The Can-SAD Study: A Randomized Controlled Trial of the Effectiveness of Light Therapy and Fluoxetine in Patients With Winter Seasonal Affective Disorder." (PDF) 163. American Journal of Psychiatry. pp. 805–812. Retrieved 2012-02-09. ^ "Applications: Health". Practical Solar. Retrieved 2009-06-09. ^ "Grab the Sun With Heliostats". New York House. 2009-06-01. Retrieved 2009-12-08. ^ "Light Therapy – Topic Overview". WebMD. 30 June 2009. Retrieved 11 July 2012. ^ "Researchers suggest SAD Syndrome is caused by a mis-timed sleep-wake rhythm". Re-Timer Blog. Flinders University. Retrieved 15 October 2014. ^ a b Sanassi, Lorraine A. "Seasonal affective disorder: Is there light at the end of the tunnel?." Journal of the American Academy of Physician Assistants 27.2 (2014): 18-22. ^ Thompson C, Stinson D, Smith A (September 1990). "Seasonal affective disorder and season-dependent abnormalities of melatonin suppression by light". Lancet 336 (8717): 703–6. ^ Benedetti F, Colombo C, Pontiggia A, Bernasconi A, Florita M, Smeraldi E, (2003) Morning light treatment hastens the antidepressant effect of citalopram: a placebo-controlled trial, J Clin Psychiatry. Jun; 64(6) 648-53. ^ Prasko J (November 2008). "Bright light therapy". Neuro Endocrinol. Lett. 29 Suppl 1: 33–64. ^ Terman M (December 2007). "Evolving applications of light therapy" (PDF). Sleep Med Rev 11 (6): 497–507. ^ Tuunainen, A; Kripke, DF; Endo, T (2004). Tuunainen, Arja, ed. "Light therapy for non-seasonal depression". Cochrane Database of Systematic Reviews (2): CD004050. ^ Mårtensson B, Pettersson A, Berglund L, Ekselius L (2015). "Bright white light therapy in depression: A critical review of the evidence". J Affect Disord 182: 1–7. ^ Smith MR, Eastman CI (December 2008). "Night shift performance is improved by a compromise circadian phase position: study 3. Circadian phase after 7 night shifts with an intervening weekend off". Sleep 31 (12): 1639–45. ^ Brown GM, Pandi-Perumal SR, Trakht I, Cardinali DP (March 2009). "Melatonin and its relevance to jet lag". Travel Med Infect Dis 7 (2): 69–81. ^ , 23 (2): 199-226.Reviews in the NeurosciencesWillis, G. L., Moore, C. & Armstrong, S. M. (2012). “A historical justification for and retrospective analysis of the systematic application of light therapy in Parkinson’s disease”. , Doi:PMID: 22499678. ^ Newman TB, Kuzniewicz MW, Liljestrand P, Wi S, McCulloch C, Escobar GJ (May 2009). "Numbers needed to treat with phototherapy according to American Academy of Pediatrics guidelines". Pediatrics 123 (5): 1352–9. ^ "Phototherapy for Acne". Aetna.com. Retrieved 2015-02-25. ^ Wright HR, Lack LC, Kennaway DJ. (March 2004). "Differential effects of light wavelength in phase advancing the melatonin rhythm". J. Pineal Res. 36 (2): 140–4. ^ Saeeduddin Ahmed, Neil L Cutter, Alfred J. Lewy, Vance K. Bauer, Robert L Sack and Mary S. Cardoza (1995). "Phase Response Curve of Low-Intensity Green Light in Winter Depressives". Sleep Research 24: 508. ^ Michel A. Paul, James C. Miller, Gary Gray, Fred Buick, Sofi Blazeski and Josephine Arendt (July 2007). "Circadian Phase Delay Induced by Phototherapeutic Devices". Sleep Research 78 (7): 645–652. ^ J.J. Gooley, S.M.W. Rajaratnam, G.C. Brainard, R.E. Kronauer, C.A. Czeisler, S.W. Lockley (May 2010). "Spectral Responses of the Human Circadian System Depend on the Irradiance and Duration of Exposure to Light". Science Translational Medicine 2 (31): 31–33. ^ "Light Box Selection". Center for Environmental Therapeutics. CET. Retrieved 25 May 2011. ^ Glickman, G; Byrne, B; Pineda, C; Hauck, WW; Brainard, GC (Mar 15, 2006). "Light therapy for seasonal affective disorder with blue narrow-band light-emitting diodes (LEDs).". Biological Psychiatry 59 (6): 502–7. ^ Barkham. "One face, but two sides of a story". Theguardian.com. Retrieved 7 October 2014. ^ Glazer-Hockstein C, Dunaief JL (January 2006). "Could blue light-blocking lenses decrease the risk of age-related macular degeneration?". Retina 26 (1): 1–4. ^ Terman M, Terman JS (August 2005). "Light therapy for seasonal and nonseasonal depression: efficacy, protocol, safety, and side effects". CNS Spectr 10 (8): 647–63; quiz 672. ^ "Bright Light May Boost Testosterone". ^ Danilenko KV, Samoilova EA (2007). "Stimulatory effect of morning bright light on reproductive hormones and ovulation: results of a controlled crossover trial". PLoS Clinical Trials 2 (2): e7. ^ Gagarina, AK (2007-12-08). "Light Therapy Diagnostic Indications and Contraindications". American Medical Network. Retrieved 2009-06-09. ^ Mayo Clinic Staff (20 March 2013). "Light Therapy. Tests and Procedures. Risks.". Mayo Clinic. Retrieved 7 February 2014. ^ Roger DR (2007-12-04). "Practical aspects of light therapy". American Medical Network. Retrieved 2009-06-09. ^ "How Finsen's light cured lupus vulgaris. - PubMed - NCBI". Ncbi.nlm.nih.gov. 2014-11-12. ^ "Engines of our Ingenuity No. 1769: NIELS FINSEN". Retrieved 2014-04-05.